Bachelor In Paradise: Let the Breakups Begin! Ashley I. and Jared head off on their overnight date, which begins with champagne and untouched snacks on an oddly sized couch bed. Ashley is down for Jared to take her virginity since he's a nice guy and she's waiting for love, so why not on a reality show where you've known each other three weeks tops. They head to the Fantasy Suite, which is a door ten feet away from their initial location, and the cameras give them their alone time. The whole house speculates whether they did the deed or not, but are underwhelmed when they return and can't be read. Ashley is swooning even harder for Jared than before, but Jared STILL doesn't feel like their relationship is going anywhere (nothing happened in the Fantasy Suite apparently). The last week of Paradise is supposed to be for serious couples and he's ready to peace out immediately. Aaaaaaand the Ashley I. tears begin. Jorge the Bartender (my new best Twitter friend) giggles with Juelia over her feelings for Mikey. "I've always liked Mikey," she says, forgetting when she blew him off. Unfortunately, the read is off on Mikey and he delivers the bad news to Juelia that he's only feeling the friend vibe with her. Juelia cries, then scurries off to tell everyone she is leaving Paradise to be with her daughter. But taketh one single mom and giveth a new on. Cassandra comes to Paradise and invites Justin out on her date card, except he's double booked after accepting Jaclyn's invite, still hanging after losing her chance with Jared. That's a lot of dates for a day, so Justin picks the one he deems hotter and rejects Jaclyn's invite. She's not pleased. But it's a good thing for Cassandra and Justin who really hit it off on their horseback riding date, bonding over their kid stories. Sparks fly right away with some beach makeout time. 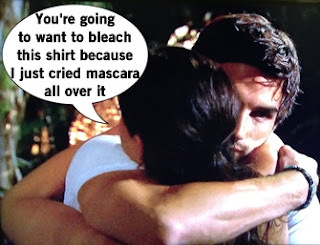 Jaclyn's unused date card ends up being used by Nick, who rolls in the sand as penance for Bachelor Pad 3 to get the card from former enemy Jaclyn. Nick wants to take out who else but Samantha, the queen of texting. They have a quiet meal in a hotel prepared by a private chef and it's as boring as the last time they did that this season. 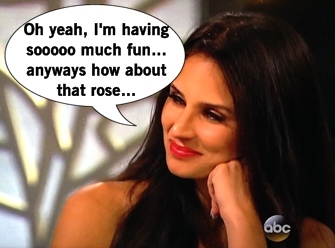 It's only interesting when Samantha clearly is angling for a rose by lightly suggesting it to Nick, then kissing him. Back at the house, all the girls see through Samantha and are sure she's not here for the right reasons. There are four women in Paradise that aren't in "committed" relationships yet, so they are all hoping the cocktail party will give them a little more time to make connections. TWIST! Chris Harrison cancels the cocktail party and stresses this night is for serious relationships only. Ashley I. willingly steps down and leaves, giving one last ugly cry in the Uber to the airport. The Rose Ceremony begins but Chris Harrison advises/warns them all that this is about starting the new great love story not just getting more open bar time. The obvious roses are for Carly and Kirk, Jade and Tanner, Samantha and Nick, and Tenley and Joshua. Justin gives his rose to Cassandra, which we suspected, and I guess this is yet again someone else Dan was interested in and lost out to. 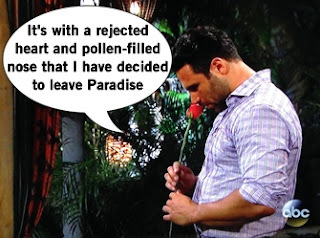 Stumped at rose time, Dan basically cycles through the girls he courted and rejected, then decides to leave Paradise since he didn't find love. Goodbye rose! Mikey offers the last rose of the night to Mackenzie, but she declines the rose and instead wants to go home. AWK-WAAAAARD! With no other options, Mikey doesn't give out his rose either and goes home. This leads to a mass exodus of the remaining women of Amber, Ashley S, Chelsie, and Jaclyn. The rose ceremony survivors are all wondering what is to come other than easier access to Jorge at the bar. Answers arrive when Chris Harrison shows up to deliver his monologue. The new arrivals are over and instead this week is for the five couples to see if their love can exist past an all-expense paid vacation. Everyone gets all-day fantasy suite dates to see how their relationships progress. While the girls express nerves and excitement, Kirk is torn. The last few days Kirk realized maybe he's not ready for this relationship or as connected as she is, so while she's giggling and unaware Kirk is wondering when he has to break the bad news. The time is now, Kirk. So after Carly continues to babble on about how perfect their life will be together, Kirk grabs her for "the talk." He thanks Carly for the best five weeks ever, but he's nowhere as close to being in love with her as she is with him. Carly is shocked by this coming out of left field and Kirk admits he's had these mixed feelings for a week. She doesn't want to have the conversation, so she runs. Literally. Carly is furious, crying along with her friends, who can't believe Kirk led on this relationship so long. Kirk tries to talk to Carly again but it's too late; she ain't having it! Both Carly and Kirk leave Paradise, one heartbroken and the other unable to explain why he didn't end things sooner.